Guests are always looking for something to do either at the ceremony, in cocktail hour, or during dinner at a wedding reception. I love this idea that can be a playful take on a guestbook without the additional cost of something like a photobooth. Print them to match your invitations, color scheme, even your venue! I loved Mad Libs as a small child, I could amuse myself for hours. This is why I was so excited to see a “Guest Libs” for wedding guests. 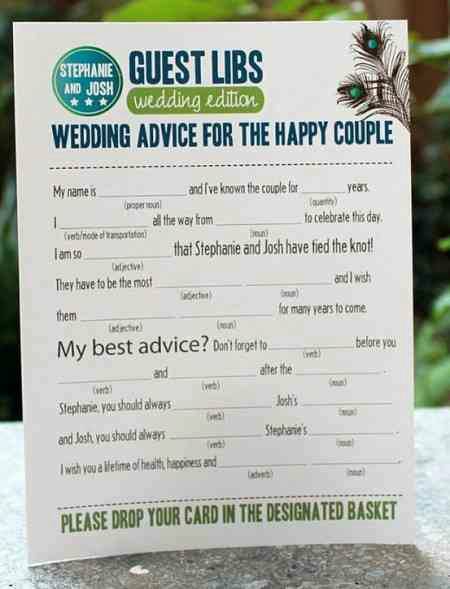 What a playful, cute, and fairly inexpensive way to get some great words of advice and stories from your guests on your wedding day!